Easter is all about chocolate, Easter Egg hunts, bunnies, spring and craft. We decided to combine all of that PLUS some tech into a fun Paper Circuit Easter Greeting Card project with a flashing LED light. In this post you can learn how to make one yourself, download the silhouette craft cutter template for the bunny and eggs and circuit diagram. 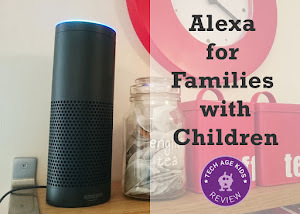 There is lots of opportunity for creativity in this project, as well as learning how a simple electrical circuit works with a switch. 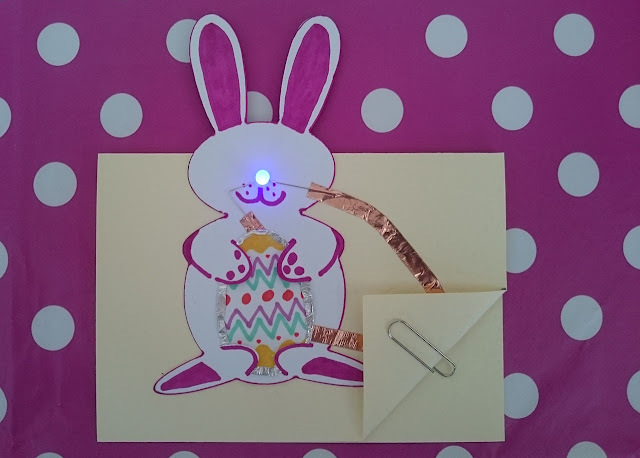 The Easter Egg is made conductive and acts as the switch to turn on the flashing LED nose of the bunny. The cut template has two Easter Eggs, one to decorate and back with some cheap kitchen foil and another to wrap with the foil from your Easter egg. My son already won an Easter egg at school, so we wrapped one of our switches in a gorgeous purple Cadbury foil. 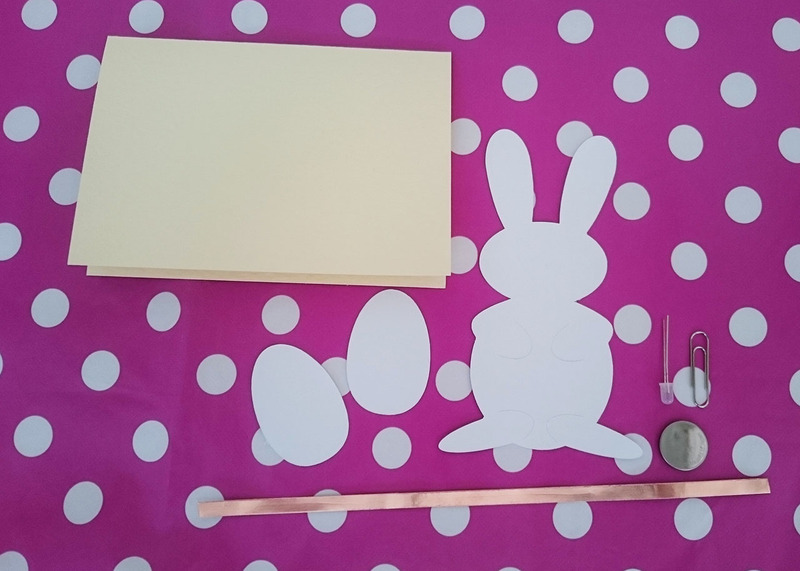 Firstly cut the bunny and Easter eggs out using a craft cutter. If you don't have one you can cut it out with scissors. 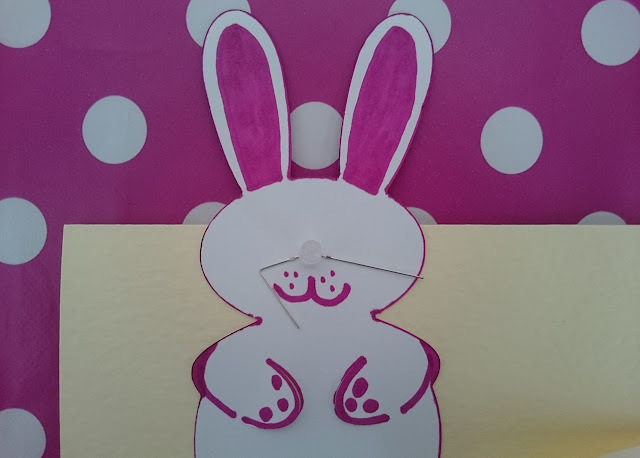 The craft cutter, easily cuts the slits in the paws of the bunny which holds the egg in place. (this is not essential, you'll just have to hold the egg (switch) in place). 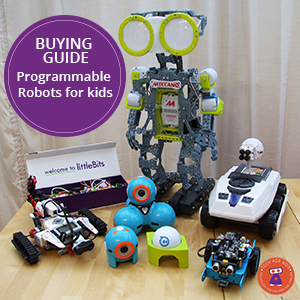 Click Here to access the template and circuit diagram. Fold the A6 card in half and then fold the right-hand corner at a right angle to create a hold for the coin battery. 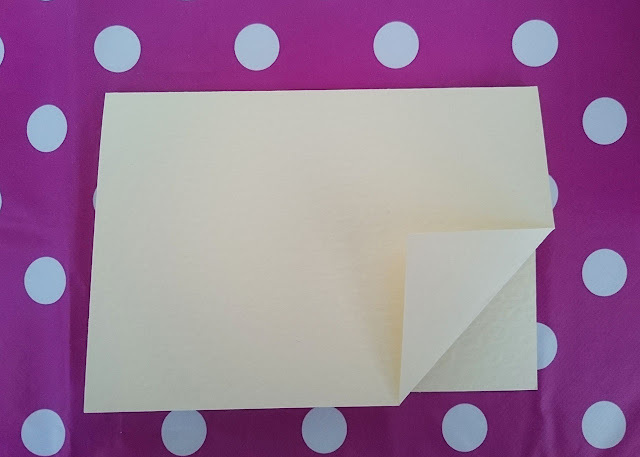 Use the coin battery to get the right size fold. You want the battery to be completely covered by the card. Prepare the components for the paper circuit. Bend the positive leg of the LED at a right angle to create the whiskers on one side. Note the positive leg is slightly longer. Cut the conductive tape into three lengths. 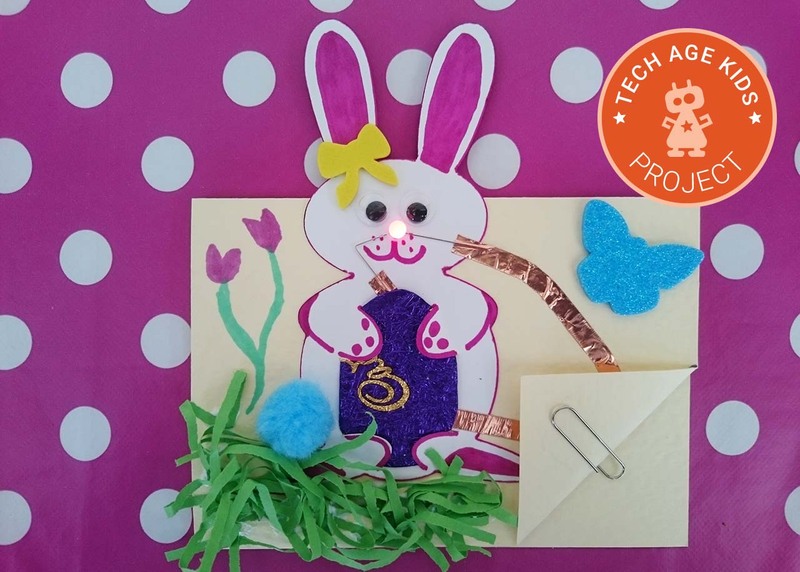 The shortest length will run from the positive LED leg to the bunny's tummy. The next length will run from the tummy (remember to leave a gap) to the fold for the battery. The longest length of conductive tape will run from the negative leg of the LED down to the other side of the battery fold. Place a coin battery in the fold and secure with a paperclip. 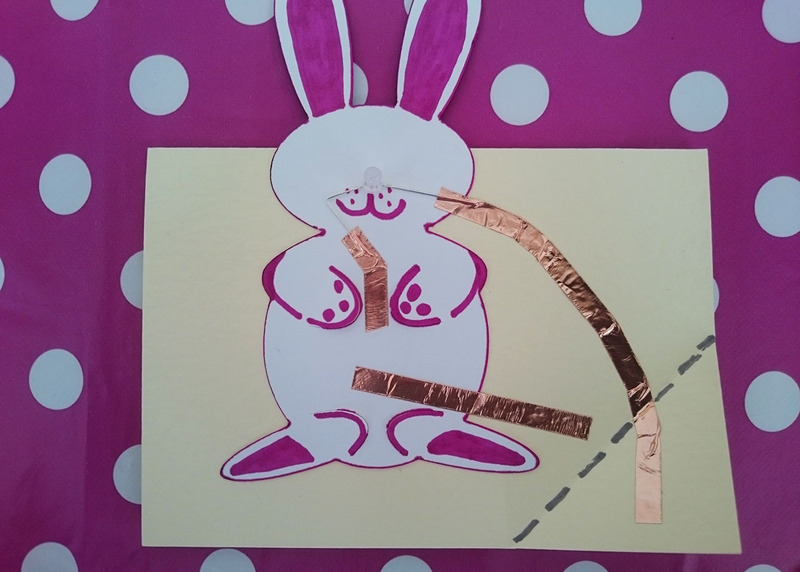 Use a piece of foil to close the gap on the bunny's tummy to test your circuit. To make the Easter Egg switch, decorate one side and stick some kitchen foil on the other side. Use the second Easter egg and wrap it in foil from an actual Easter egg! 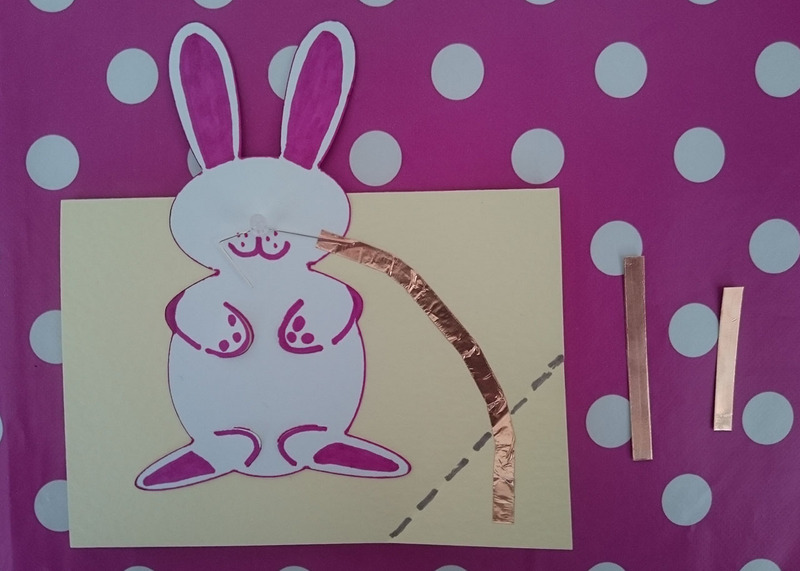 And there you have it, a fun and creative DIY Easter Card. 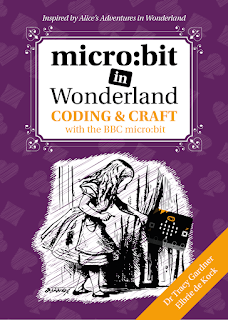 Why not try to make your own tech craft this Easter!